"Serve these as a side with a rotisserie chicken for a simple summer meal. 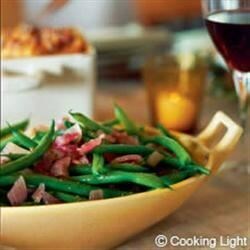 To simplify things, you can make and refrigerate the vinaigrette and steam and chill the green beans a day ahead." Cook green beans in boiling water 5 minutes. Drain and plunge beans into ice water; drain. Place beans in a large bowl. Cut onions in half vertically. Drizzle cut side of each onion half with 1/4 teaspoon oil. Sprinkle halves evenly with salt and pepper. Place 1 thyme sprig on 1 onion half; top with other half. Wrap in foil. Repeat procedure with remaining thyme and onion halves. Bake wrapped onions at 400 degrees F for 1 hour or until tender. Cool to room temperature. Discard thyme; chop onions. Combine remaining 1 tablespoon olive oil, onions, dill, vinegar, and mustard in a small bowl. Toss beans with onion mixture. Serving size: about 4 ounces green beans and 1/4 cup onion vinaigrette.